I love hiking and trekking, but unfortunately, Cambodia isn’t really renowned for these activities. 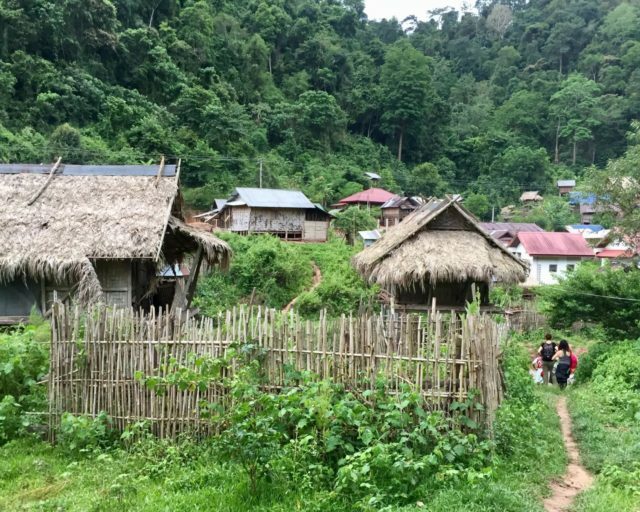 So naturally, one of the main things I was keen to do whilst in Laos was to get out into the rainforest and countryside for a decent trek, after my time in Luang Prabang. I’d done a fair bit of research and decided trekking in Luang Namtha would be my best bet. I would have liked to have gone further North to Phongsali but time wouldn’t allow on this occasion. 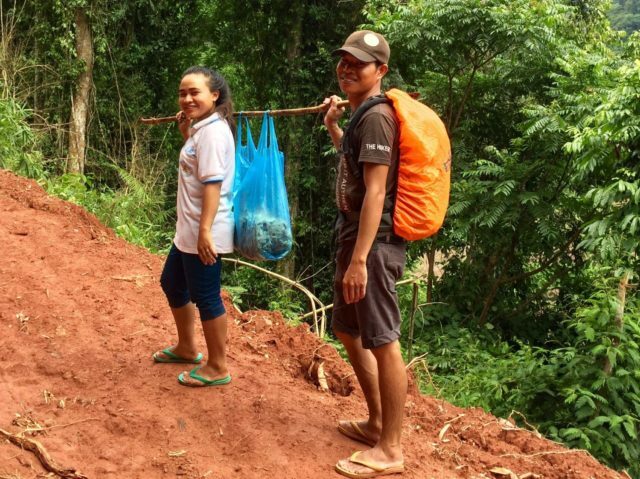 After trawling through numerous other travel blog posts and TripAdvisor reviews I decided to do a trek with The Hiker a community-based eco-tour agency. 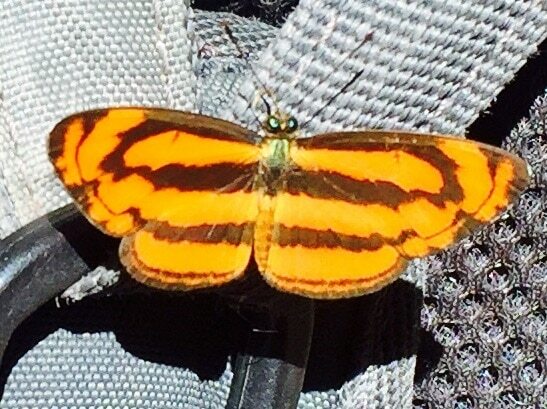 The Hiker provided me with a complimentary one-day trek which I’ve reviewed below. Read our full Product Review Disclosure here. 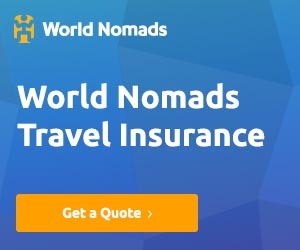 I wanted to do The Hiker’s Nam Ou Wilderness Trek (two days, one night) or the Wild Thrill Trails Camping and Homestay Trek (three days, two nights). 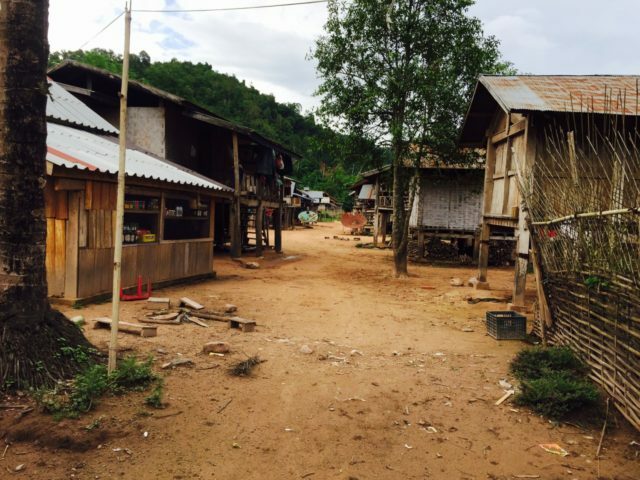 However, it wasn’t to be as I also had my heart set on visiting Nong Khiaw and Mong Ngoi. I just didn’t have the time to do it all so something had to give, so I cut my trekking in Luang Namtha down to one day. Luckily Tom, the manager at The Hiker, was very accommodating and let me join the first day of their Combined Adventure 3 – Kayaking and Trekking in Namha National Protected Area. I turned up at The Hiker shop, conveniently located two doors down from my hotel, at about 8:30 am to find out whose trek I’d gatecrashed. It turned out to be a young German couple and two French girls; fortunately, they didn’t seem to mind me joining them. We also met our guides Noi and Jai both who introduced themselves with broad smiles, as we piled into a minivan which had its own dedicated driver. 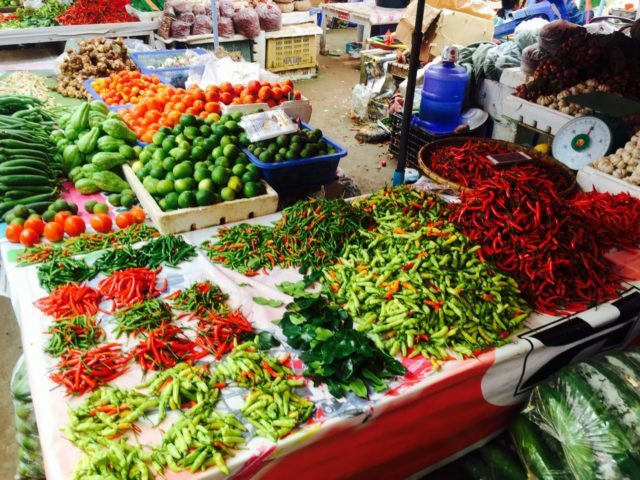 First stop was the bustling, colourful local market to collect a selection of typical Laos food to take with us for lunch. Whilst there I decided to try the local coconut rice pancakes (Kanom Krok). They were quite stodgy but tasty and gave me some extra energy for the trek ahead of me. I also bought some balloons as I knew we’d be passing through some local villages. I wanted to have something to give the children, but don’t like to give sweets out. Although the kids prefer gifts of sweets it’s not good for them, especially their teeth. After the market, there was one more quick stop to pick up a guide from one of the villages we’d be trekking to. She was a young woman called Kong and her friend La. We’d find out a bit later why they both came with us. So, with four guides between the five of us, we were confident we’d be well looked after! We stopped at the side of the road and Noi passed us all bottles of water for the trek. Then it was time to get started on our trek into the Namha National Protected Area. In convoy, we followed a small trail off to the left of the main road into young (secondary) rainforest. The trail immediately ascended up and up through the trees. It was definitely off the beaten path and we had to watch our feet as trip hazards were everywhere. We constantly had to dodge out of the way of low hanging vegetation and clamber over logs and duck under fallen branches. Finally breathing heavily and drenched in sweat we stopped for a much-needed water break. Kong from the local village and her friend were chattering energetically away in Lao and gesticulating. Whatever they were saying sounded interesting so I asked Noi to translate for us. Noi told us that Kong was talking about the last trek she came on when she had to walk home through the forest by herself. It had started to get dark and the spirits in the trees had freaked her out, causing her to run most of the way back. Many of the ethnic tribes in Laos are Animists who believe that everything (living and inanimate objects) have a spirit. Understandably that can be a bit scary when out amongst the dark trees alone at night. It transpired that this was the reason Kong was accompanied by La this time, so she wouldn’t be alone with the spirits again when she had to walk back. We continued trekking uphill for a while longer, then as the forest grew denser we started to descend. Noi encouraged us to take regular short breaks to rest and drink some water. This was a necessity; despite the shade given by the leafy canopy for much of the time, it was still a hot day. As we progressed we got to see some examples of the local fauna. 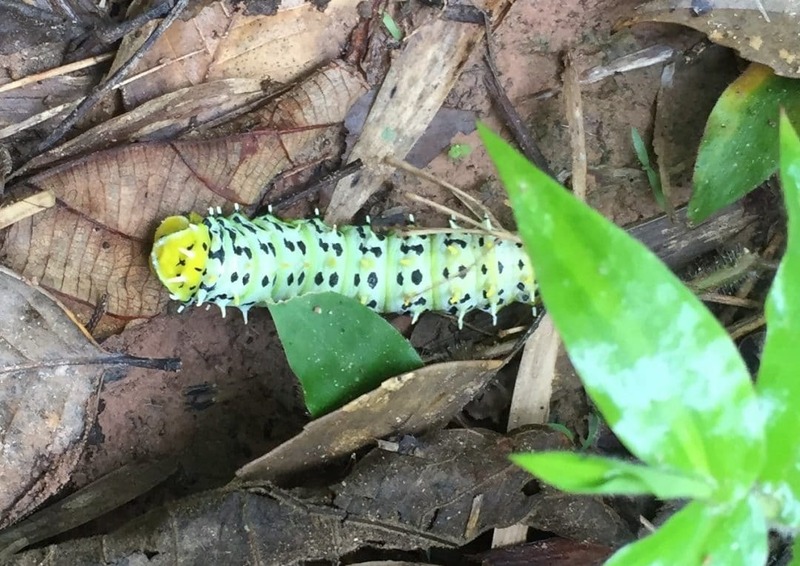 We spotted several vibrantly coloured butterflies and strange looking caterpillars. A lizard or two also scuttled across our path and we caught a glimpse of a snake disappearing into the leaf litter. Oh, and I mustn’t forget the bitey red ants that were all too eager to sink their pincers into us every time we stopped. The two village guides walked a small distance ahead of us continuing their lively chat. At one point they both shrieked with excitement and darted off the track into the trees. We caught up to and found them enthusiastically picking lots of large mushrooms. They showed us how to check the spores for signs of worms before putting the good ones in a bag. Noi explained they’d be used for dinner that night. The girls also cut and stripped some insanely spiny rattan and palm hearts with their machetes – more dinner ingredients. I was gutted that I’d be missing out on a delicious woodland stew, especially as mushrooms are one of my most favourite foods. The girls’ excitement grew exponentially over the rest of the day as they discovered troop after troop of mushrooms. They ended up with such a heavy bag full it had to be carried on a stick between two people. At around 12:30 pm we stopped in a small clearing for a picnic lunch of the traditional Lao food bought from the market that morning. The guides set out a blanket of banana leaves on the forest floor and emptied the food parcels on top of it. We all sat around on more banana leaves and ate the food with our hands in usual Lao fashion. Luckily I’d remembered to bring hand sanitiser as our hands were filthy from the trekking and of course, wild toilet breaks. The food was really tasty and there was a good and plentiful variety, the local names of which I can’t remember. There was Grilled Fish, Bamboo Shoot Noodles, Eggplant Stirfry, Vegetable Stirfry; all seasoned with local herbs. There was also Fried Pork Skin (pork scratchings as we call them in the UK), the obligatory Sticky Rice, and a banana each for dessert. 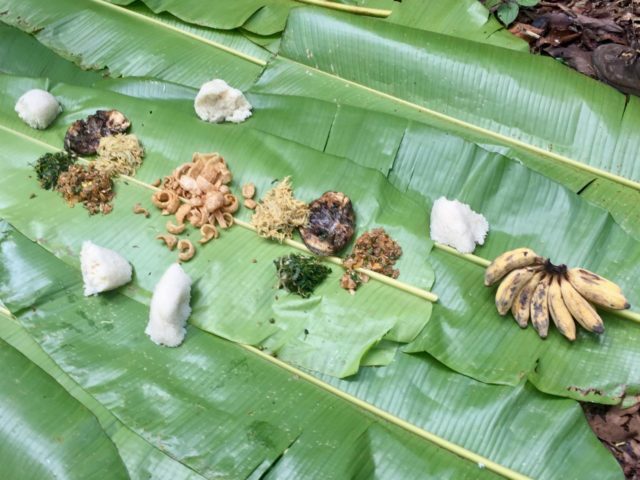 Food demolished, the guides rolled up our banana leaf blanket and food remnants and threw it away behind some vegetation. There was no trace left of us ever being there, a prime example of responsible travel. Our hunger sated we resumed our trek through the forest just as it started to rain. The ground became slippery underfoot, making the going a tougher as we had several streams to cross. As I’ve gotten older ‘the fear’ in me has also grown. Whereas ten years ago I’d have happily crossed a stream or river by balancing on slippery logs and rocks, I’m much more cautious nowadays. I opted to wade straight through the water to mitigate the risk of falling and breaking something. Of course, that meant I had to suffer soaking trainers and feet for the rest of the trek; a small price to pay for finishing it in one piece I think! When crossing one stream I followed Noi’s directions and suddenly found myself stuck ankle deep in mud. I managed to extract myself after several minutes and nearly losing a trainer in the process much to everyone’s amusement! If I didn’t know better I’d think Noi had done it on purpose to make the others laugh! The village guides also had us in stitches a couple more times on this part of the trek. They were always shrieking about something, but it never turned out to be anything serious. It was no more than an odd leech or a few lazy wasps buzzing about. Not the huge blood sucking monsters or ginormous wasps nest we imagined upon hearing the initial screams! We found the girls frequent panicking and over-reactions endearing and the laughter that ensued brightened up the rainy afternoon. After an hour or so of rather damp trekking, we emerged from the trees out into fields. We walked parallel with a stream down to the Nalan Neua Village which is Village inhabited by people from the Khmu tribe (descendants of the Khmer people of Cambodia). Just outside the village was a big wooden school built on stilts. Then inside the village were lots wood and bamboo houses with corrugated tin or thatched roofs. Over 200 men, women, and children live there, although there were only a few adults around that day. I assume the rest were out working in the fields. Those that were there welcomed us with warm smiles. We wandered around the village for a while, looking at the houses, vegetable gardens, and a couple of little shops. There was even what looked like a bar – or ‘Beer Lao Drinking Place’ as it painted on the wall! It was a feat in itself trying not to trip over one of the many piglets and chicks that were running about. As we explored several children peered at us out of doorways. They didn’t venture out though until I remembered the balloons I’d bought at the market. As soon as we started blowing them up the children swarmed to us from all directions. They loved the balloons and it was comical to watch a few of the moe cheekier kids take one, then run off and hide it. Seconds later they’d be back for another thinking we’d fallen for their trick! Shortly after leaving the village we heard yet another high pitched yell from Kong and La, who were up ahead. They came running back towards us shouting something in Lao. Noi and Jai proceeded to jostle us into a small clearing in the trees right back away from the trail. Noi told us that there was an ‘angry cow’ coming up the track and we had to keep out of the way. As some of you will have read before, I don’t have a good track record with cows so I retreated even further back. The huge raging bull I’d envisaged thundering down the muddy track towards us, actually turned out to be a young cow. It was rather unimpressed at being forcibly dragged slipping and sliding through the mud back to the village. Panic over we continued on our way. Much of the final stretch of the trek was downhill and it was treacherously slippery. It was really challenging and I nearly went flying on more than one occasion. One of the others actually ended up in the mud on their backside but luckily wasn’t hurt. Some walking poles would definitely have come in handy. Apart from the guides finding valuable sought after red mushrooms and us fighting to stay upright, the last three hours of our trek was pretty non-eventful; but enjoyable nonetheless. We stayed mainly in secondary rainforest, although we did get about an hour in primary rainforest. Finally, after eight and a half hours of trekking, we arrived at Chaleunsouk Village, where my tuk-tuk was waiting on the road to take me back to town. This was where the others were to spend the night in a homestay. It was sadly time for me to leave the others to enjoy their evening and all the woodland food collected en-route…not that I was envious at all! The next morning they’d leave for their day of kayaking on the Namha River which would complete their adventure. The price of a tour with The Hiker differs depending on the length and activities. They offer trekking, kayaking, mountain biking and ethnic experiences. They begin at $25 USD (£19 GBP) for a day trek and go up to $114 USD (£87 GBP) for a challenging five-days, four-nights trek. The two-days, one-night trek and kayak tour with homestay that I joined in costs $62 USD (£47 GBP) per person. 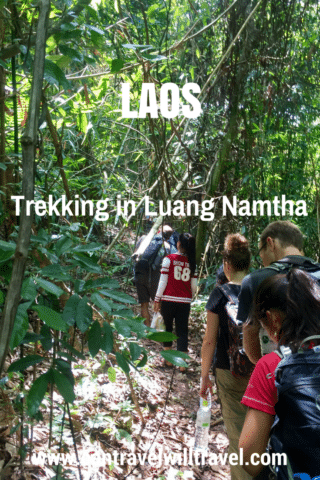 I thoroughly enjoyed trekking in Luang Namtha with The Hiker. It was longer than expected and more strenuous due to the wet conditions but I was ready for some exercise so it was perfect. I also can’t recommend our guides Noi and Jai enough. They were amazing and along with the excitable Kong and La made the trek good fun. The only downside was that I wasn’t able to continue for another day or two deeper within the Namha National Protected Area. 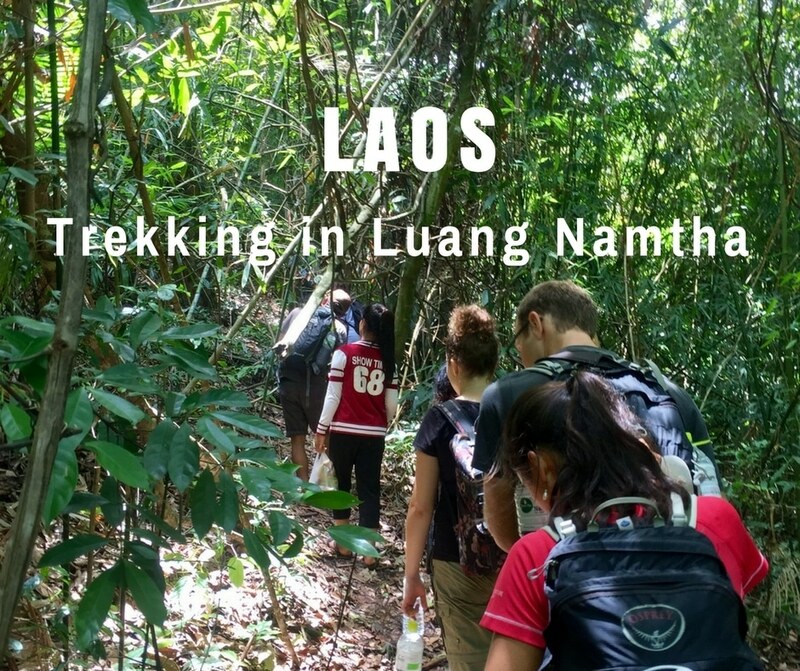 Have you been trekking or on an eco-tour of any description in Luang Namtha? How did you find it? Product Review Disclosure: The Hiker provided me with a complimentary day trek as part of their two days, one-night trekking and kayaking tour with a homestay. This did not influence my post in any way and as always I’ve provided a balanced and honest review. Very nice hiking story. I like the idea of giving balloons to the kids in the local village. I am into hiking as well, maybe in my next hiking activity, I’ll try to bring balloons or books perhaps for the young locals. ☺☺ Thank you for sharing. Yes it was; from the comments I’ve had I think it probably does have many similarities with India in regards to the ‘family style’ (sharing style) of dining! yes it was really interesting. I was in South India but unfortunately didn’t get to eat on Banana leaves there, hopefully next time! Hi; Philippine festivals sounds great. I hope I get to experience one at some point! 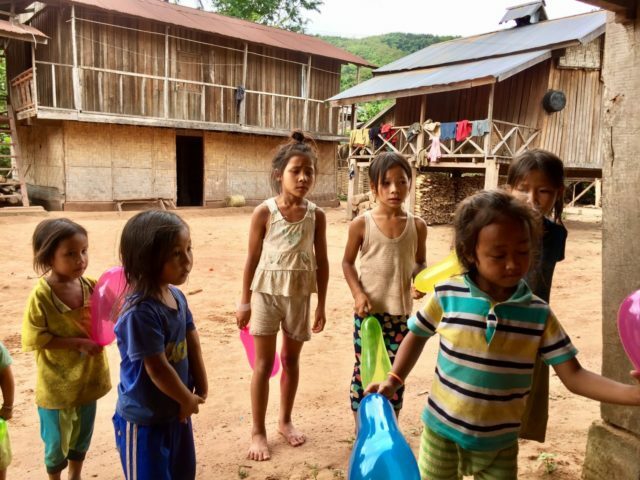 Originally I’d wanted to give school supplies but unfortunately, I couldn’t find any in our short stop at the morning market that day so balloons had to do this time. It made them smile anyway. I’m off to Vietnam in September and will definitely be trekking there so will take some stationary bits and pieces with me ready! This is indeed a fascinating trek. Rain forests have their own charm and are really irresistible. But what I really liked about this is that you were able to interact with the locals and had an immersive experience of the places that you visited too. Yes I loved that aspect too; it was great being able to interact with the communities! Wow, what a great hike that you guys owned. I love trekking and this one is a kind of adventure I like. I also love that you were able to engage with locals, especially the young children. They seemed to really enjoy with your balloons. Eating on the Banana leaf is sound interesting too. Thank you so much for sharing this with us. This is beautiful. Like in Laos, People in southern part of India too eat on plantain leaves as a habit. I loved the part where you took balloons for the kids. That is so thoughtful. I’d love to be able to click pictures of the locals and so I am thinking that getting a mobile printer for the kids would be great. Treks are a great way to explore a destination and lose some extra calories! I guess your retreat in the homestay would have been the perfect way to relax. You mentioned that most of the tribes are animist in nature. That sounds interesting and helps you promote sustainable way of touring and traveling if you look at it from a different perspective. Yes absolutely, I love getting out and trekking, it was just a shame I didn’t have time to stay for the homestay too! I found learning about the Animist beliefs really interesting too. I’ve recently hiked Mt. Ulap eco-trail. It was also a slippery trek. I wish I was able to eat in a banana leaf with my bare hands – this is a traditional Filipino custom. I guess we share a lot of customs with other Southeast Asian countries. I’d like to trek Mt. Ulap eco-trail too, sounds good! I would also love to visit the Philipines at some point. Fingers crossed!